Lomo de Cerdo Relleno de Higos (Pork Loin Stuffed with Figs) is not complicated to make, and it is a very attractive and tasty dish that may fool your guests into thinking you slaved in the kitchen to prepare it. Make a simple bread and fig filling. Stuff filling into the pork loin and roast. Serve extra stuffing on the side. It makes a wonderful main course for a holiday or any day. Chop onion, garlic, figs, almonds and parsley. Preheat onion to 400F degrees. In a large open frying pan, heat 3 tablespoons of olive oil. When pan is hot, add the finely chopped onion and cook until translucent. Add garlic and cook on medium heat to not burn the garlic. Remove pan from stove and stir in all ingredients except pork. Mix thoroughly. Make sure to season with salt, pepper and paprika. If stuffing mixture is too dry, sprinkle water over stuffing mix. Remove loin from butcher’s packaging. Rinse and pat dry with paper towel. Trim any excess fat from the loin. Place loin on work surface, flap side up and spread open. Spread half of stuffing mixture on loin. Roll up and tie in several places using clean kitchen string. Line bottom of a roasting pan with aluminum foil. Brush foil with olive oil so loin is less likely to stick. Place pork in pan and roast in oven for 60 to 75 minutes. While pork is roasting, make 6 balls from the remaining stuffing. About 15 minutes before removing the roast from the oven, carefully place the balls in the pan. When pork is cooked, remove from oven and allow it to “rest” for about 10 minutes. Pork will continue to cook as it cools. 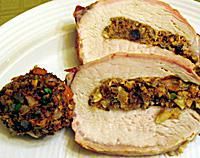 Cut roast into thick slices and carefully transfer slices onto plates with a stuffing ball and pan juices. Serve with home-fried potatoes.